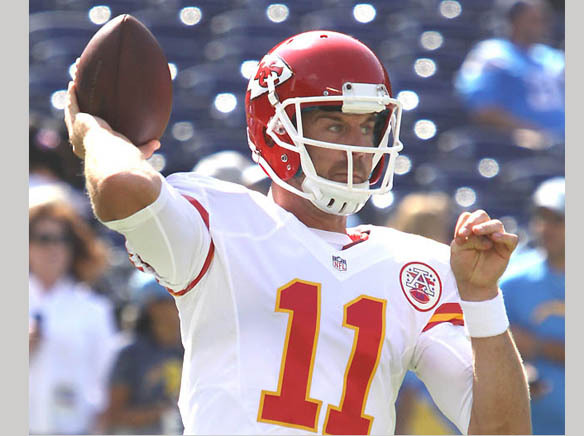 Helix High School alum Alex Smith’s stock had to rise considerably with the NFL Kansas City Chiefs following the Chiefs’ dramatic 30-27 overtime victory against the defending Super Bowl champion Denver Broncos in a key AFC West contest on NBC-TV’s national broadcast of “Sunday Night Football” on Nov. 27. The win kept Kansas City (8-3) within one game of the division-leading Oakland Raiders (9-2) and promoted the Chiefs to the No. 1 wild card slot among AFC teams. Denver fell to 7-4 in the AFC West standings. The win put Smith, the NFL’s No. 1 draft pick in 2005, back into the national spotlight. Smith and the Chiefs entered Sunday night’s primetime game coming off a disappointing 19-17 home field loss to the Tampa Bay Buccaneers the previous week. In that game, Smith threw for 261 yards, scored one rushing touchdown, passed for one touchdown and one interception in the end zone. Kansas City took a 9-0 lead on Denver courtesy of a safety when Chiefs defensive star Justin Houston sacked Broncos quarterback Trevor Siemian and Tyreek Hill then returned the free kick 86 yards for a touchdown. But the Chiefs had to fight an up hill battle from there against a punishing Denver defense. The Broncos took a 10-9 lead on a 33-yard field goal by Brandon McManus and six-yard touchdown pass from Siemian to Jordan Taylor. The Chiefs responded with a three-yard touchdown run by Hill only to have Siemian connect with Emmanuel Sanders on a 35-yard touchdown pass to put the hosts back on top 17-16. Denver took a late 24-16 lead when Siemian hooked up with Bennie Fowler on a 76-yard TD completion. The finish was among the most exciting this season on the “Sunday Night Football” broadcast. Down by eight points with three minutes remaining in the fourth quarter, Smith stitched together a 13-play, 75-yard scoring drive to pull his team to within two points on the scoreboard. Smith threw a clutch 10-yard pass to Hill on fourth down to extend the Kansas City drive. Smith then threw a three-yard scoring pass to Hill that required a video review to confirm the touchdown. Initially, the ball was placed at the one-yard line with one second to play. However, a video review showed that as Hill’s leg came down he completed the catch in the end zone. The officials reversed their call on the field and the Chiefs were granted the touchdown to narrow the score to 24-22 with 12 seconds to play. Smith then completed the eight-point rally by taking the snap and running to his right before tossing the two-point pass to Demetrius Harris. Tied 24-24, Denver received the ball first in overtime and marched down the field to take the lead on a 44-yard field goal by McManus. Down 27-24, Smith then marched the Chiefs the other way to secure a 37-yard field goal by Cairo Santos to extend the game. The Broncos received the kick-off and reached midfield before facing a crucial fourth-down decision. Denver coach Gary Kubiak elected to attempt a 62-yard field goal. However, the try by McManus was wide left, giving Smith and the Chiefs the ball at their opponent’s 48-yard line with 1:03 to play in the 15-minute overtime period. Smith promptly made two completions to get his team into field goal range. Kansas City coach Andy Reid called time out with five seconds to play to set up a potential game-winning 34-yard field goal attempt. The outcome of the game came down to the last play. If Santos made the field goal attempt, the Chiefs would win; if Santos missed, the game would end in a tie. Santos hit the ball and it began veering to the left. The ball hit the upright and bounded to the right. Instead of falling back to the field, the ball traveled behind the right upright to complete the field goal. The game-winning kick simply added more drama to the ending of the game. “In a division like this that is so competitive, for us to get the win was sweet,” Smith said. passed for 2,297 yards with 10 touchdowns and four interceptions in 2016. Siemien completed 20 of 34 attempts for 368 yards and two touchdowns in Sunday’s loss. Justin Houston led the Chiefs defense with 10 tackles, three sacks and one forced fumble. Von Miller, the MVP of Super Bowl 50, paced the Broncos with nine tackles and three sacks. Travis Kelce had eight receptions for 101 yards for the Chiefs. In an unusual touchdown trifecta, Hill caught a touchdown pass, scored a rushing touchdown and ran back a free kick 86 yards for a touchdown. The Chiefs out-lasted the Broncos despite finishing with 273 net offensive yards to Denver’s 464 net offensive yards. The hosts held the visitors to just 83 net rushing yards in the game. 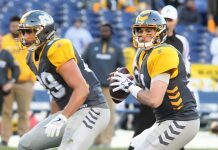 The old American Football League rivals rematch Christmas night in Kansas City in what looms like a critical contest for both teams. The Raiders held onto first place in the AFC West by out-dueling quarterback Cam Newton and the Super Bowl runner-up Carolina Panthers, 35-32, on a 23-yard field goal by Sebastian Janikowski with 1:45 to play in regulation. Newton passed for two touchdowns and ran for another as the Panthers fell to 4-7 on the season. Derek Carr passed for two touchdowns and Khalil Mack scored on a six-yard interception return to lead the Raiders, who are looking to make the playoffs for the first time since 2002. The Chargers kept their faint playoff hopes alive by defeating the host Houston Texas 21-13. Quarterback Philip Rivers passed for 242 yards and three touchdowns – one each to Dontrelle Inman, Tyrell Williams and rookie tight end Hunter Henry. The Chargers improved to 5-6 on the season and, though they may have little chance of winning the AFC West title, they could very well determine who wins the division with home games remaining against Oakland (Dec. 18) and Kansas City (Jan. 1). The Chiefs currently have the best wild-card record, followed by the Miami Dolphins (7-4), Broncos, Pittsburgh (6-5), Buffalo Bills (6-5), Tennessee Titans (6-6), Indianapolis Colts (5-6) and Chargers. Seven teams sit ahead of the Chargers in the wild-card race. A lot would have to happen for the Chargers to make the playoffs, though the Bolts still remain mathematically in the playoff hunt. Miami has won its last six games while Oakland has won five in a row. The four division winners, plus two wild-card teams qualify for the NFL playoffs in each conference. New England (9-2) leads the AFC East while the Baltimore Ravens (6-5) leads the AFC North and Houston (6-5) leads the AFC South. The Dallas Cowboys (10-1) lead the rugged NFC East while the Detroit Lions (7-4) lead the NFC North, the Seattle Seahawks (7-3-1) lead the NFC West and the Atlanta Falcons (7-4) lead the NFC South. Dallas and Detroit both won their traditional Thanksgiving Day games in front of national television audiences. Dallas, braced by the sensational rookie duo of quarterback Dak Prescott and running back Ezekiel Elliott, has the best record in the NFL.